Come experience the classically designed Embassy Suites by Hilton Atlanta Buckhead hotel located in the heart of the prestigious Buckhead community centrally situated between Lenox Square Phipps Plaza and the new Buckhead-Atlanta shopping dining districts. We are located 7 miles north of downtown Atlanta 16 miles north of the airport and just 1 and a half block from MARTA rail. Our generous amenities and spacious accommodations allow us to cater to the savvy customer by delivering functionality and the full service experience. Embassy Suites Buckhead offers multiple options for suite accommodations including king beds double beds adjoining suites conference suites presidential suites accessible suites two-bedroom/two-bathroom suites and Premium Floor suites. Accommodations include refrigerator microwave Keurig* coffeemaker iHome* dock station two flat screen TV*s Ergonomic seating sleeper sofa safe parlor sink and bedroom vanity. 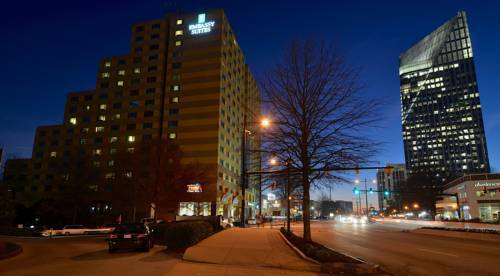 Hotel services include new WiFi connection full service meeting and catering Precor fitness and business centers indoor/outdoor pools whirlpool complimentary shuttle service in the Buckhead area onsite laundry facility gift shop Starbucks outlet and Ruth*s Chris Steak House. Onsite self and valet parking are available for a fee. The hotel has sustainability initiatives for energy water and recyclables. *Keurig and iHome docking stations in Premium Floor suites standard coffeemaker and clock/radios in all other suites. Serving USDA Prime corn-fed beef live Maine lobster jumbo Gulf shrimp and Ahi Tuna. Upscale American Cusisine located within a 1 mile radius of the hotel. Managed by Buckhead Life Restaurant Group. East-West Fusion. Located in the striking Pinnacle Building in the heart of Buckhead.